Elspec’s passive harmonic filter is a dynamic and flexible solution that absorbs all the harmonics from all sources connected to the network system. Designed as a dynamic compensation system, it has the ability to respond to all the reactive energy and maintain harmonic filtration requirements in less than one network cycle (based on the EQUALIZER operating specifications). 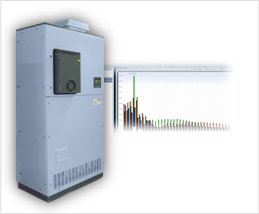 By automatically calculating the reactive energy consumption, high harmonic levels and dynamic load changes in real-time, it is able to provide a complete answer to power quality compensation for almost any electric network condition. Parallel resonance occurs when the magnitudes of the capacitive and inductive reactance are equal. If the parallel resonant peak is aligned with the frequency of a characteristic harmonic injected by the non-linear load, high voltage and currents can flow which may cause damage to equipment in the network. To counter this phenomena, it is critical to calculate the location of the harmonic filter. Based on Elspec's policy to survey each network environment prior to installation, this calculation ensures that the position of the filter is optimized. Due to this strategic location Elspec’s passive harmonic filters is able to provide an alternative impedance path and is uniquely adapted to include/exclude serial reactors. Elspec’s passive filter is custom designed for the specific system impedances, the load current harmonics, the background voltage distortion, as well as interactions with other loads and sources in close vicinity. Ideally the filter is said to be tuned to the frequency that makes its inductive and capacitive reactance to be equal. In a normal network environment passive tuned filters are mainly applied to low voltage networks. Elspec’s filters can also function in a medium voltage network environment by the utilization of a step up transformer.